The book of 2 John is known as the shortest book in the Bible (by verse count) with only 13 verses. It is a short epistle even by New Testament standards, and there’s really only one message that John was trying to put across. It was a time of the apostles, and many men and women of God were traveling around different places trying to spread the gospel of Christ. There were many victories, but at the same time, many false teachers had appeared and began to cause trouble by spreading false preaching around. The recipient is the lady – and whether you take it literally or figuratively, John was clearly explaining the situation and how important it was to not to show hospitality to false teachers and their doctrines. It would be easy for these deceivers, who do not acknowledge Jesus Christ as coming in the flesh [1 John 1:7] to take advantage of the Christians’ natural inclination to be hospitable to strangers. It was therefore necessary to counsel Christians to engage godly discernment in sending traveling teachers on their way. In this study, we will take an interest in one of the characteristics of false teachers, paying special attention to the concept of running as used in the Bible. 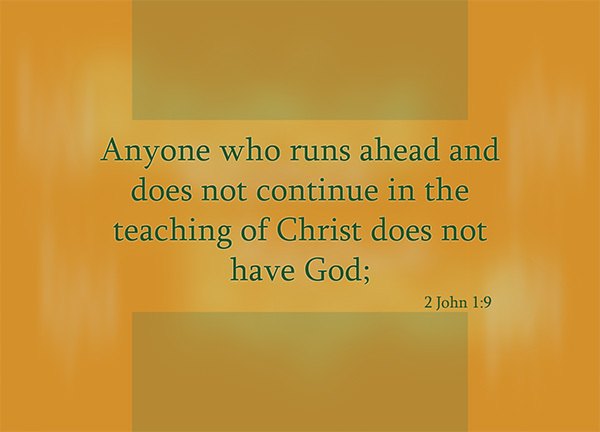 Anyone who runs ahead and does not continue in the teaching of Christ does not have God – to run in our race of life and keeping within the track of God is a concept that Paul regularly talked about in his epistles. We are not new to the idea of running along with God – I run in the path of your commands, for you have set my heart free [Psalm 119:32|Article] – this was a concept that was long taught amongst the people of God. Paul’s well-known thoughts on running and races and athletes are also not new to us – I have fought a good fight, I have finished my course, I have kept the faith [2 Tim 4:7|Article] – this verse remains one that I dearly hope to be able to say when the day comes in which I near the end of my life. Yet Paul also said Do you not know that those who run in a race all run, but only one receives the prize? Run in such a way that you may win [1 Cor 9:24]. Many years ago I was in my school’s track team, and while I was never a pro, I did dedicated training as a short-distance runner for a period of time. There are all types of techniques to learn while running – breathing techniques – you use different breathing techniques for different types of races, and you use different types of breathing techniques at different parts of a long race. There are also different kinds of running techniques and methodologies that different people use according to their preferences – it would be foolishness to, for example, start a marathon at your full speed, just as it would be foolishness to not begin a short-distance dash at your full speed. There are also times in which you do not hit full speed at all in the entire race for the sake of your stamina, for the sake of your team, for the sake of eventual victory. You know in any race it’s human nature to want to speed up if somebody has overtaken you? But if you would have the discipline to keep to your strategy, keep within the limits of your current pace, then at some point in the race, you will prevail when the other has tired, and you will win. Running for leisure, running to train, and running to win – these are all different kinds of running. We as Christians are called to run too, but there’s a certain track that we must run on, even if it will lead us through murky paths, up the hills, into the forests – even if there is a shortcut that we know of if we would just turn the corner. This track is the path of God’s commands. This track is to continue in the teaching of Christ. This track ensures that we’re always looking to God. This track guarantees the presence of God in our lives, because we’re clinging on to his word. It is especially easy to stray from the path when you’re the first of the pack. If you’re the second or subsequent, it’s always easy to just follow the guy in front of you (that’s how we get led astray too). But when you’re at the front, you may just be too engrossed in your passion and your energy and your stamina that you just blindly run ahead without a care for the signs that asked you to turn. Many times we are so passionate and energetic in our ministries that it comes to a point where we run to a place that we have no idea where we are at. Be wary. Run to win. whoever continues in the teaching has both the Father and the Son – running without the Lord or walking in the path of the Lord – which would be more pleasing to God? I’m sure it’s obvious enough. The second part of this verse contrasts the first, and yet the ‘running’ part is notably left out. I’m sure God will be greatly pleased if you are able to run in his path; but I’m equally sure that God will be greatly pleased if you are able to walk in his path. In this context, though, John refers to the teaching of Christ. Behaving as the teachings of Christ taught is one point, certainly, but more importantly is perhaps that we ought to keep teaching the right things and do not preach false teachings. You may be eager about spreading the gospel, but is the gospel that you preach the gospel of Christ, or is it a false religion that you’re preaching? Those who continue in the teaching of Christ has both the Father and the Son. Those who continue in the teaching of Christ will have obeyed the teachings of both the Father and the Son, and enjoy a relationship with them. Run, if you can; run, if you must; as long as you run in the paths of God’s commands. Thank you for reminding us of the importance of holding to the truth.